Okay back from last week’s Orlando MegaCon. And wow what a productive trip it was. Many things to show everyone (interviews), many signatures to giveaway, and a special auction that will be going on Ebay soon. More on that in the InvestComics Newsletter coming out soon. So if you haven’t done so yet, sign up to the newsletter to get an early bid on a unique item that will go to a good cause. It’s quite awesome. As for the interviews, check out the InvestComics front page to watch interviews with Terry Cronin (Students of the Unusual), Tom Mumme (The Accelerators/Comic Book Men), Lou Ferrigno (The Incredible Hulk), and many more coming down the pike. Coming up soon; Jimmy Palimiotti, Gil Gerard, Gail Simone, Eric Esquivel, Pat Broderick, and the Walking Dead zombie Michael Koske! ….Getting back to the King of all Indie Terry Cronin for a second. I inadvertently forgot to include the signed copy of the questions he answered with Brianna Floss on the video as a giveaway/contest. Check out the photo of the actual signed Terry Cronin questionnaire that can be yours to the right. All you have to do is sign up to the InvestComics Newsletter and you will be eligible! Sign up to the Newsletter either below (end of this article) or on the front page of the website. Write on the comments below that you signed up. It’s that simple! Winner will be chosen at random. And don’t fret, if you don’t win this time, there are many autograph contest coming your way! Sorry, U.S. residents only. A special thanks to a lot of people at this year’s MegaCon. Sebastian Piccione (Sunday Knight Comics), Brianna Floss (Awesomeness), Dirk Grobb (the BEST unknown artist that will be HUGE one day soon), Rick Shea, Shaun Sorenson (Famous Faces & Funnies – for just being cool guys and having a great booth), and Shaun Cobble/Kirstie Cobble (Breaking the 4th Wall). You all made this year’s MegaCon a lot of fun and I appreciate it beyond words. And because of the chaos of last weekend, The Breaking the 4th Wall interview with Legend Norm Breyfogle (via Youtube) went up late. Click right HERE to hear Shaun Cobble spend almost 2 hours with one of the greatest Batman artist ever. This week fans get Guardians of the Galaxy (2013 3rd Series) #1. As spoken about already in the InvestComics Hot Picks #258, one can get the lowdown on all of the characters appearing in this title as well as the movie. Click HERE to get the scoop and a head start on these sooner than later to be hot books. Note: Rocket Raccoon is the book to have, get on that pronto. FF (2012 2nd Series) #5 will give readers the mystery of our favorite fiery redhead Medusa. Find Medusa’s first appearance in another FF book, but this one from 1965’s Fantastic Four #36. Not only does this comic give us the first Medusa, but the first appearance of the Frightful Four! This comic is brought to you by Stan Lee and Jack Kirby. This explains the $750 price tag for a CGC graded 9.2. On the complete opposite side of the spectrum; Fury Max (2012 Marvel) #10 brings us the origin of Barracuda. The big guy first appeared in Punisher #31 (Max -2006). Find this laying around in the 50 cent bins. Not a bad pick up for the modern day Kingpin. Another week another death. Robin a few weeks ago and now this week in Uncanny Avengers (2012 Marvel Now) #5 we hear that a major character will take a dirt nap. The new 52 presses onward with their reintroductions. Fury of Firestorm (2011-) #18 gets a redo with the villain Multiplex. Find Firestorm #2 (1978) and buy it. Not so much for the first appearance of Muliplex, but the team that involved with the incarnation is impressive. Gerry Conway, Al Milgrom, and Bob McLeod. And look at the awesome Milgrom cover! Yes this is a keeper. Another comeback occurs in Superman (2011 3rd Series) #18 with H.I.V.E. The first appearance of H.I.V.E. is Action Comics #513 (1980). Again, much like the previously mentioned, the creators on this book are the draw here. Marv Wolman and Curt Swan give birth to H.I.V.E. Having two creators like this on a first appearance comic is quite the find. Mister X comes back for another round. Check out Mister X Hard Candy (2013 Dark Horse) #0. Mister X first appeared in Mister X #1 (1984 – Vortex Comics) and at one time was a very hot comic. Maybe the new number one issue will heat up the back issue market. There’s a moderate amount of number one issues (and a zero) to check out this week, but there is one that will sell out quick and command bucks in the aftermarket. Don’t say InvestComics didn’t warn you. When you come across East of West (2013 Image) #1 this week, pick it up. That is all. Here is the rest of the pack that should catch your eye and investment savvy. Time Warp (2013 DC/Vertigo) #1, Dragon Age Until We Sleep (2013 Dark Horse) #1, and Honey Badger vs The World (2013 Antarctic) #1. Honey Badger still don’t give a sh*t.
That’s it for this week. Stay tuned for some very cool contest. And sign up to the InvestComics Newsletter to be the first on the block to know about the auction! Subscribed! Thanks again for the great info and awesome Site! And thank YOU Neil for checking out InvestComics! Are all your contests open to U.S. residents only? As a Canadian fan of your site as well as a subscriber to your newsletter I hope this isn’t the case. Joel. The reason for the U.S. residents only is because shipping cost can get extremely costly. To be quite honest with you, I’m not even sure how much shipping cost are to our closest and most awesome neighbors! Congrats to David H. You’ve WON!! 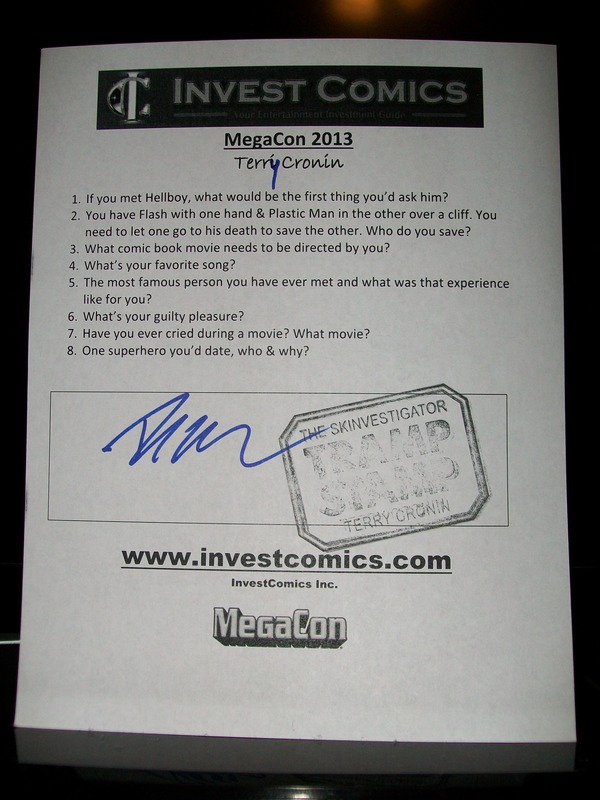 The Signed Terry Cronin MegaCon questionaire is yours! !